The Joe Niekro Foundation has announced the 2014 Joe Niekro Research Grant recipients. 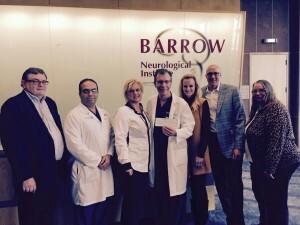 A total of $90,000 has been awarded by the foundation, which is committed to supporting patients and families, research, treatment and awareness of brain aneurysms, AVMs and hemorrhagic strokes. “We are thrilled to award these recipients with this critical funding needed to help support the advancements of neurological research,” states JNF Founder, Natalie Niekro. 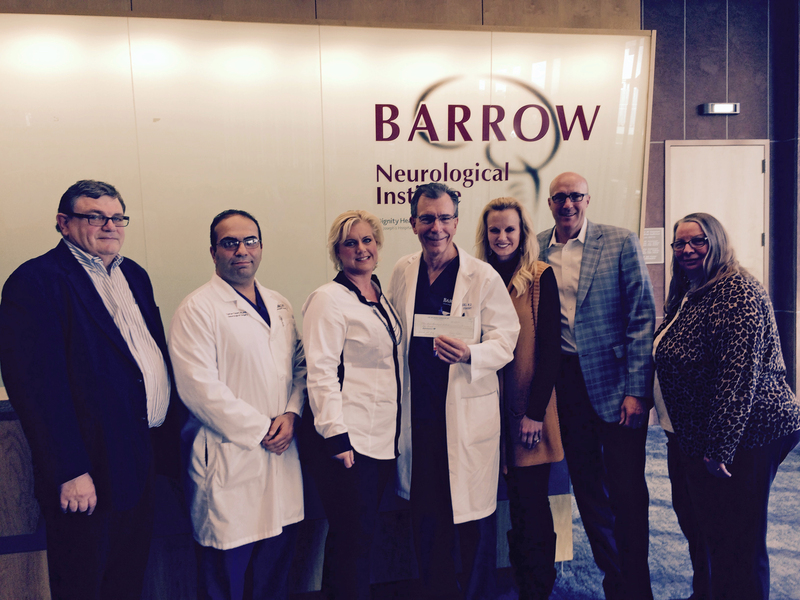 JNF Founder, Natalie Niekro along with Board Members (from left to right) Bill Michels, Kimberly Chapman, Gary Simms and Linda Michels present a $50,000 check to Dr. Joseph Zabramski and Dr. Yashar Kalani of Barrow Neurological Institute. The first awardee, Barrow Neurological Institute, has received a seed grant in the amount of $50,000 for the study Deconstructing the vascular tangle-A molecular biopsy of cerebral arteriovenous malformations by Dr. Joseph Zabramski and Dr. Yashar Kalani. This groundbreaking study will aim to understand the pathogenesis of AVM formation and identify signaling pathways involved in vascular development and AVM formation. A $20,000 grant will go to the University of Michigan for the project, Intraventrical injection of noncellular fluid from subarachnoid hemorrhage patient leads to ventricular enlargement and periventricular injury, by Dr. Aditya Pandey. This current project aims to understand the role of human subarachnoid hemorrhage (SAH) non-cellular cerebral spinal fluid (CSF) in causing hydrocephalus and periventricular cellular injury. The final recipient, the SNIS Foundation who received a $20,000 award for the Joe Niekro Research Grant. This annual grant enables investigators to conduct pilot projects related to brain aneurysms, AVMs or stroke. It is the intention of the grant that the seed data from these projects will indicate feasibility and appropriateness of the research prior to applying for further funding; therefore, emphasis will be placed on research deemed to have the most potential for future funding. Since inception, the Joe Niekro Foundation has awarded over $500,000 in research funding and has built a patient advocacy network that expands across the globe. The foundation provides education on the causes, risk factors and treatments of these conditions, while funding the advancement of neurological research. Click here to view the list of previously funded projects. For more information about funding opportunities including program guidelines and contacts, visit https://www.joeniekrofoundation.com/research-grants/grant-guidelines/.